A part of utilizing insurance benefits to cover autism treatments is knowing a treatment request could be denied. Sometimes, the insurance carrier (insurer) may not be aware of research articles that could back up your request or understand ASD has rights under the federal parity law. Appeals are not easy and most initial appeals are not won by consumers but do not get discouraged. Let’s use these opportunities to educate the insurer and build support for ASD treatments being medically necessary. Speak with your employer’s HR department and/or consider requesting a care manager with the insurer to see if you can resolve the issue. Read the link above for common denials in ABA for talking points. File an internal appeal if you are not satisfied and still being denied. 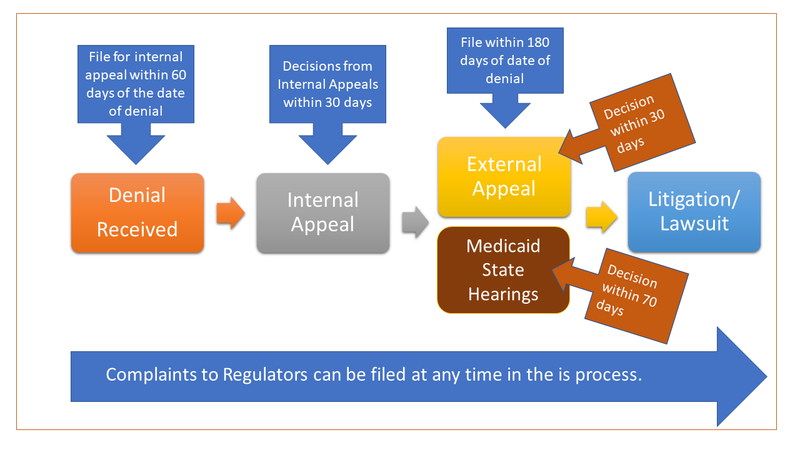 Internal appeals are often denied, but you have to do that step first, so don’t get discouraged. Utilizes internal appeals and external appeals through state hearings and administrative appeals. External review appeals are consumer’s best chance for a fair hearing by an objective independent medical professional. Consider filing a Complaint with the Regulatory Government Agency if you are having challenges working through the appeal process. Self-Funded Insured ERISA Employer Plans = Department of Labor. Consider filing before losing an external appeal, the court views the external review organization (ERO) as the expert.